Award-Winning pianist brings you romantic and heartfelt compositions you will fall in love with. Perfect wedding music. It is said that hearing an artist’s music can give you a glimpse into their soul. If this is true, then experiencing Gina Leneé’s music reveals a passion for art and a talent that truly is a gift. Born and raised in California, Gina began playing the piano “by ear” at the tender age of four. Playing songs she learned in Kindergarten and at church, she had no trouble sitting down at the piano and playing any song she wanted. Realizing their daughter’s talent, her parents began private lessons where she received classical training. Even then, she enjoyed spending hours composing her own songs. She soon began performing at school, church and community functions. Throughout her life, Gina has been fortunate enough to work for some amazing nonprofit organizations in the Central Valley. Raising funds and awareness for the Muscular Dystrophy Association, California Law Enforcement’s Wish Upon A Star, Saint Agnes Medical Center and Children’s Hospital Central California has given her the opportunity to incorporate her music to serve others in a unique way. She used the release of her CD’s as an event to benefit Wish Upon A Star and Fresno Youth Advocates. She extended the “Wish” for a local cancer patient, Alyssa Danley and invited her to record two songs on her Christmas CD. She has performed at various events for Saint Agnes, Children’s Hospital and MDA’s Jerry Lewis Labor Day Telethon. She has performed on Carnival Cruise Lines and for such dignitaries as California Governor Arnold Schwarzenegger and Fresno Mayor Ashley Swearengin. Gina’s music is inspired by the people and moments in her life. This gifted composer, musician and producer has created four memorable CD’s, From the Heart, Moments With You, Holiday Wishes and Lullaby Collection. 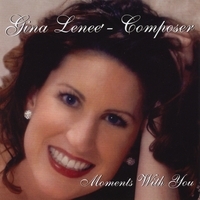 Her CD’s From the Heart and Moments With You are deeply personal recordings. For Gina, her role as a composer is more profound and fulfilling than that of a musician. Because her music comes from the heart, it’s hard to listen to it and not be moved. In fact her CD’s have been used in pediatric hospitals, neonatal intensive care units, healing and wellness centers, day spas, art galleries, birthing and Lamaze classes, relaxation therapy sessions, stress relief therapy, sleep aids for infants and children and parent-child bonding sessions. Of special note, Gina was recently selected as a 2009 Artist of the Year and was recognized by the Fresno Arts Council for her artistic contributions to Central California. For Gina Leneé, the music in her heart has been the force that has brought her to this point in time and she is cherishing every note and melody.